Sangla is one of the most popular valleys of Himachal Pradesh. Sangla valley is also known as Baspa valley as the valley is on the riversides of Baspa river, which is the a tributary of River Satluj. Sangla is a little town in the midst of the valley with high altitude peaks all around and the valley filled by variety of vegetation. The valley starts at the altitude of 2500 meters and above and remains filled with snow almost 3 months of the year. The beautiful valley is growing popularity among global visitors as the valley surrounds many beautiful treks and cultural visiting places. 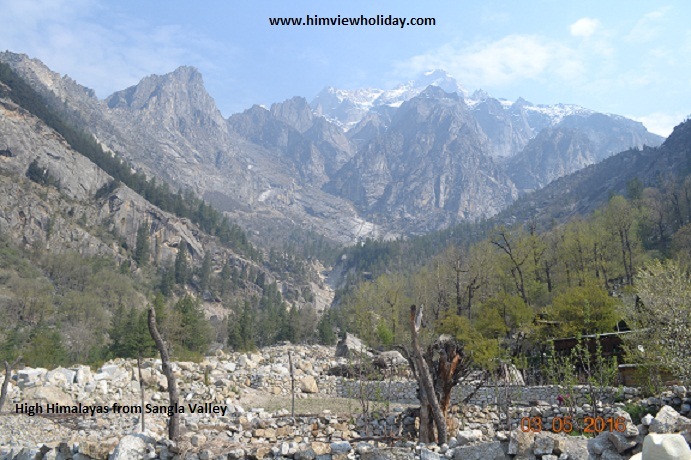 Himview Holidays has arranged all category Sangla valley tour package/Sangla Valley Tour Packages especially the cheapest and lowest cost Sangla valley tour package for budgeted tourists. The tourists from Kolkata, Delhi, Bhopal and Ahmadabad loves the destination a lot. The peaceful beauty of nature has made Sangla a paradise. The nature photographers, the wanderers,the trekkers, the adventurists, the mountain and rock climbers and the botanists all love to explore the valley with great enthusiasts. Sangla town is the centre of Sangla tehsil approximately 220 km away from Shimla. The valley name is also given after the town. The beautiful town is with facility of Banks,ATM’s, internet and other modern facilities. The town located on the right side of the river Baspa. The Baspa river view is best from the town. Himview Holidays for our Sangla valley tour package have arranged almost all best hotel for our customers for advanced bookings. Kamru fort is the tourist spot of the Sangla valley tour package located near the Sangla town. Kamru fort was constructed by the Bushaher kings and was once the capital of Bushaher entity. The unique fort in the middle of high Himalayas attracts the visitors a lot. Kamru village is situated near Kamru fort. The village is termed as ancient at the fort and the history of Kamru. A very dense village is at an altitude of 2700 meters from the sea level. The village seems in the lap of Himalayan mountains. Chhitkul is the best part of Sangla valley tour package. A 28 KM away from Sangla Chhitkul is the last inhabited village of India in the valley. The extremely glorious locations of the valley attracts the visitors going to Chhitkul. The apple orchids and potato fields both makes the masterpiece of the nature. Both are of very good quality and costly. Chhitkul is also a religious for both Buddhist and Hindu pilgrims. The great known Kinner Kailash Parikrama also ends here at Chhitkul. Himview Holidays provide Cheap and lowest cost 4 nights and 5 days Sangla valley tour package from Chandigarh. Key route destinations for Sangla valley are Shimla, Kufri, Fagu. Theog, Matiana, Shilaru, Narkanda, Hatu peak, Tannijubbad, Kumarsain, Nirath, Rampur, Jhakhari, Jeori, Sarahan, Taranda, Bhabanagar, Karchham, Sangla, Kamru village, Rakshham, Batseri and Chhitkul. All these are major destinations of Sangla valley tour package. Reaching at Chandigarh Airport/Railway Station/ Bus Stand our taxi guides the visitors towards Shimla. From hot and humid plains to cool and pleasant hills the journey begins with freshness and charm. Night stay and dinner at hotel in Shimla. After breakfast move to the Beautiful valley Sangla. The NH 22 will show you one of best driven roads of Himalayas. The tourist destinations like Kufri, Fagu and Narkanda are on the way for Sangla. In the evening at Sangla delicious dinner and night stay. Day three of Sangla valley tour package is the most important day of the tour. This is the time to explore the valley nature with both hands. In the morning after breakfast move to Chhitkul. On the you will see the glaciers melting into rivulets and feeding Baspa river. The valley is filled with apple and stone fruit orchids. Reaching Chhitkul see the Baspa river from nearest point and also visit the Buddhist and Hindu temples. Come back to Sangla and visit the Saffron house and Kamru fort in the evening. Dinner and night stay at hotel in Sangla. In the morning after breakfast shop at least some of local handcraft materiel for memories if not for use and also enjoy the local street food. Move towards Shimla. On the way stay for a while at Rampur fort, Nirath Sun Temple and fun parks at Kufri and Fagu. Dinner and night stay at hotel in Shimla. In the morning after breakfast move to Chandigarh for further train/flight/bus with best memories. Our other popular tour packages are Kinnaur tour package, Shimla Manali tour package from Chandigarh, Manali tour package and Shimla tour package. Address: Sunny Cottage, Sanjauli Dhalli bye pass, Near Chalaunti,Shimla.